Program of Study Admissions Requirements Program Requirements Tuition, Fees & Scholarships Program Mission and Goals Policies and Procedures Program Outcomes What is an Athletic Trainer? Faculty Request Information Apply Now! The Master of Athletic Training program is a two-year graduate program that prepares students to challenge the Board of Certification examination and enter the profession of athletic training. A 67-credit, the competency-based curriculum allows you to complete the program in just two years armed with the skills to enter the profession confidently and quickly. Varied clinical rotations over four semesters provide extensive experiences with an emphasis on clinical reasoning. 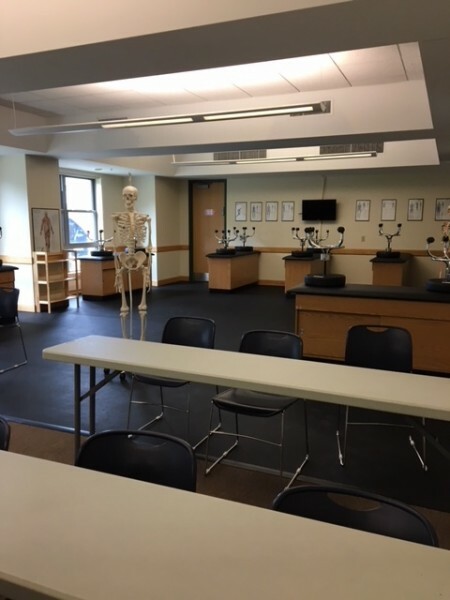 Learn from highly skilled clinicians at area colleges, high schools, Killington Medical Clinic and Vermont Orthopaedic Clinic. Work with other health care professionals in disciplines such as emergency medicine, orthopedic medicine, family practice medicine, chiropractic medicine, and physical therapy. Benefit from an immersive, full-time clinical experience as an athletic trainer to complete your program. Applicants to the program must be enrolled in the Castleton University Kinesiology/Pre-Athletic Training bachelor’s degree program OR have earned a bachelor’s degree from a regionally accredited college or university by the time of matriculation to the MAT program. Please take note of the specific admissions requirements. Enrollment in the MAT program is limited and admission is highly selective. Here is a link to the Vermont Association of Athletic Training which features some coverage of an event recently hosted here at Castleton! 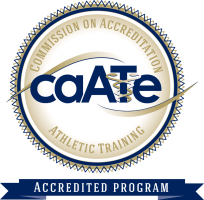 The program is accredited by the Commission on Accreditation of Athletic Training Education (CAATE). Our first cohort of Master of Athletic Training students will enter in 2020.